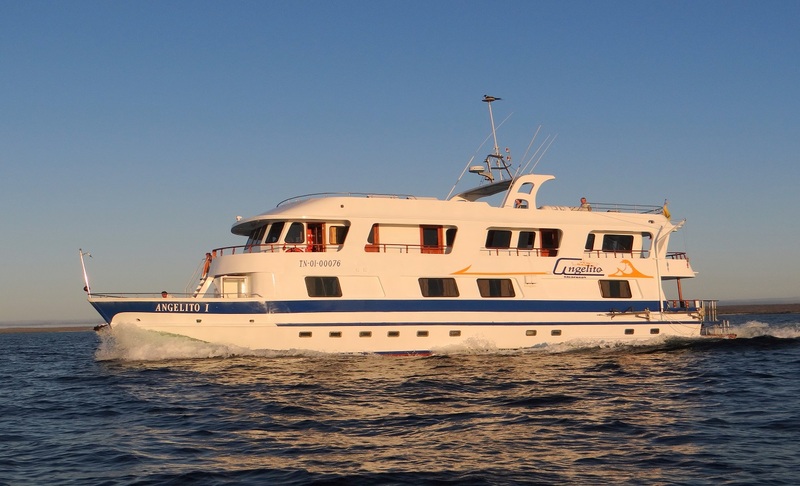 This 8 day cruise offers a diverse and comprehensive voyage through the northern, central and southern islands of the Galapagos. You can expect to experience the wildlife and scenery of this unique destination with excellent naturalist guides. 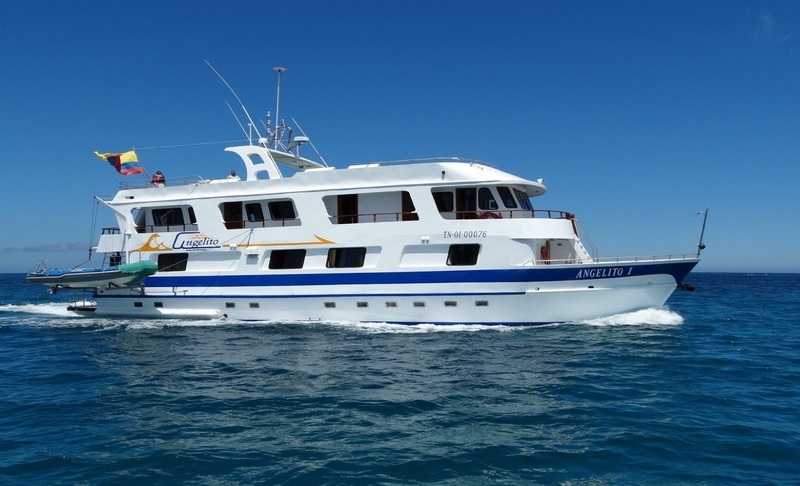 The Angelito yacht is a charming 16-passenger tourist-superior yacht and offers a comfortable way to see the Galapagos. 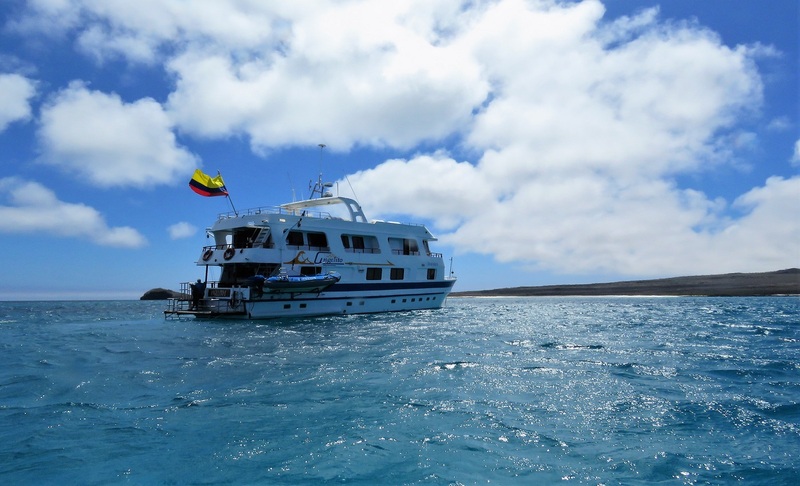 Today you will take a flight from mainland Ecuador to the island Baltra in the Galapagos Islands. Arriving on the airport, the visitors have first to pay the entrance fee of US$ 100 for the National park. 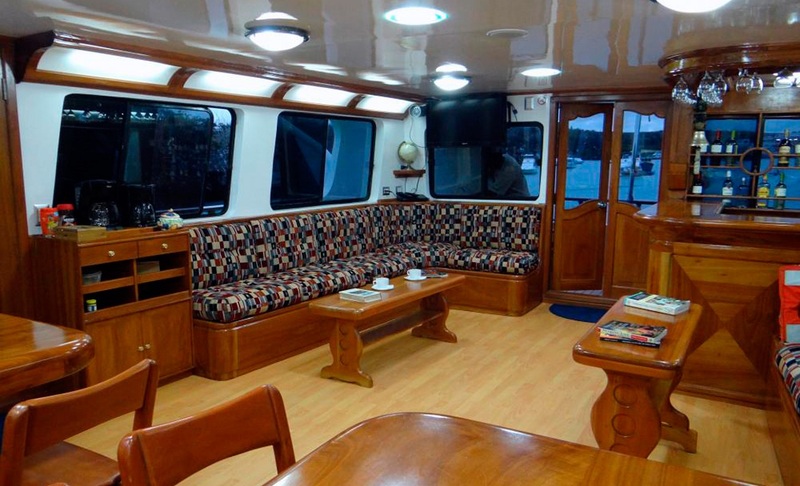 Leaving the arrival hall, the National Park Guide of the is waiting for you and accompanies the whole group to the harbour of Baltra, where your "Yacht Angelito I" is anchored. The cruise can begin! It’s a flat uplifted island in the "rain shadow" of the island Santa Cruz and for this reason, with dry vegetation of the Arid Zone. Loop trail. The dry landing on a landing peer is often somewhat difficult depending of the swell. 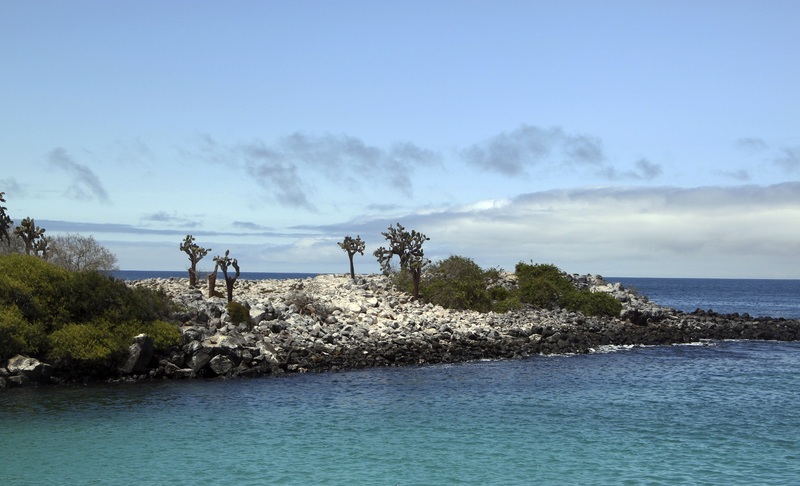 The arrival on the rocky coast is full of surprises with the sea lions, swallow-tailed gulls, sally lightfoot crabs and marine iguanas. The trail leads through the nesting area of colonies of blue-footed boobies and frigate bird. There is a possibility that you will be able to snorkel around Pinnacle Rock, the most famous landmark of Bartolome. 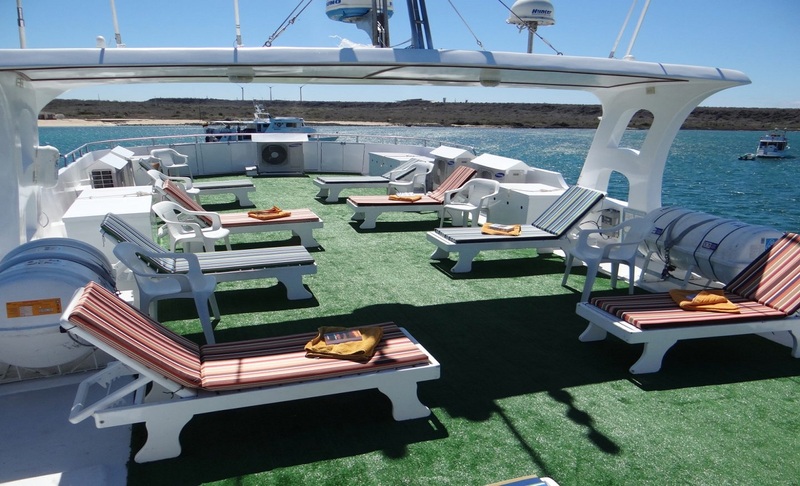 In the late afternoon we will go out on the dinghy and travel along the coast in search of Galapagos penguins. These penguins live and nest in the lava tubes of this rocky coastline. Dry landing by the cliff. The Prince Phillip's Steps offer the only possibility to climb the steep basaltic cliff. The following easy trail leads first through a small nesting colony of masked boobies and crosses a low and dense forest of palo santo trees where the red-footed boobies have their nests. Arriving on the edge of the island there are thousands of the small petrels nesting in the crevices and tubes of the fragile lava. They are the favourite food of the short-eared owls. On both sides of the trail there is a big Nazca booby nesting colony. 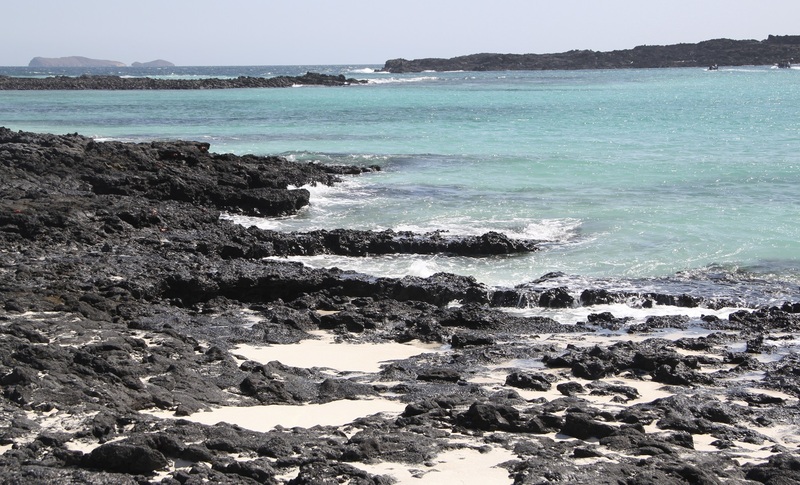 On the whole walk we can see Galapagos sea lions, sally light foot crabs and marine iguanas. 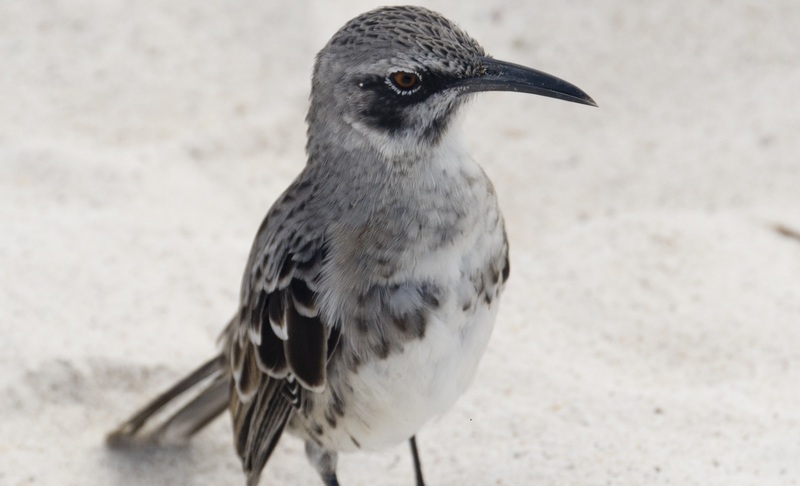 Depending of the season, there are also a lot of migrant shore birds, living on these rich coasts during wintertime. 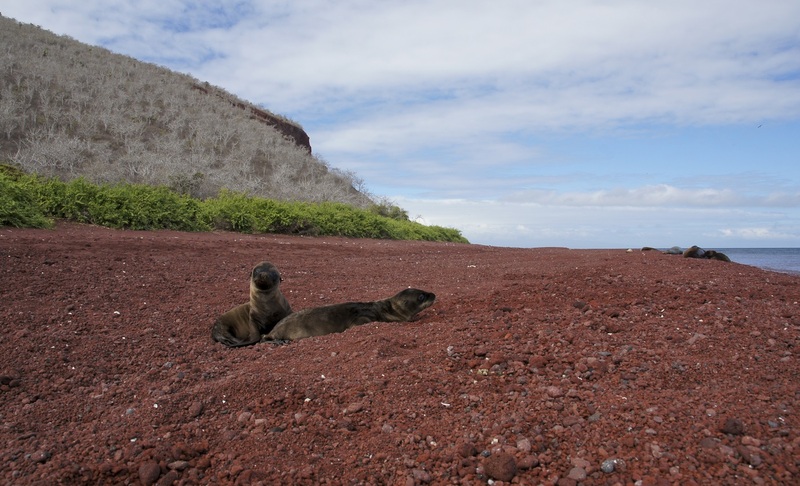 On the turning point of the trail is the start of a Galapagos fur seal colony. 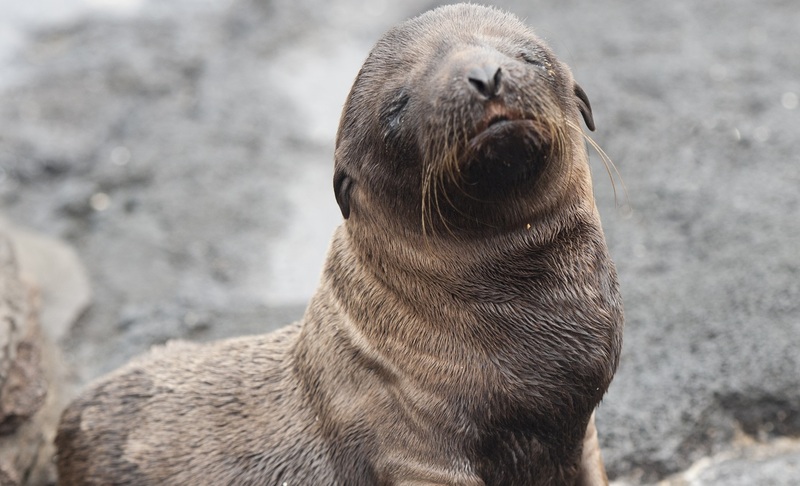 The Galapagos fur seal has found an ideal living space in the crevices and caves of the rocky lava coast. Rabida looks red with the lava containing a lot of ferric oxide in the lava. Very special is the red sand of the beach with the saltbush vegetation and the silvery palo santo trees on the slopes. 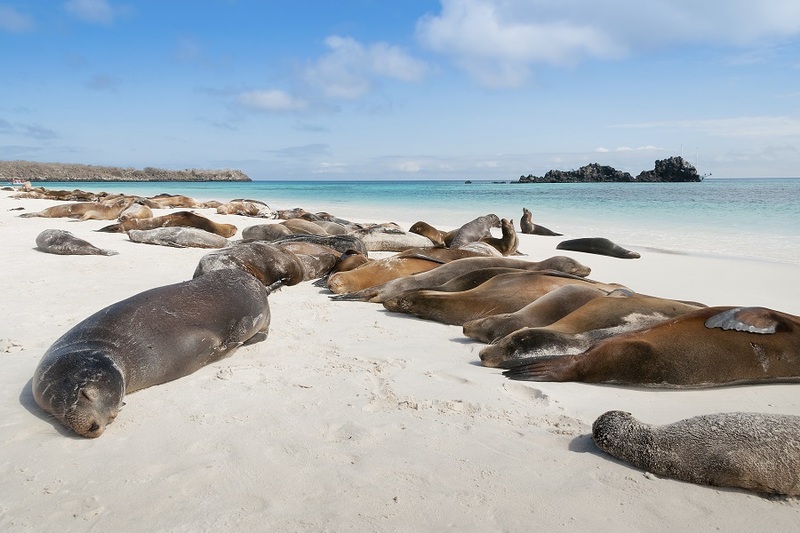 The batch of Rabida had before the last "El Niño) one of the biggest Galapagos sea lion colony. This colony has to recuperate again from the small remainder population. There is a small lagoon behind the zone of saltbush vegetation with (depending of the season) flamingos and white-cheeked pintail ducks. The visit to the Charles Darwin Research Station gives the opportunity to get to known the scientific work taking place in the National Park. Especially the raising programs for the different subspecies of the giant tortoises are very well documented. It is also a good opportunity to observe the Galapagos tortoises up-close; the symbol of Galapagos. 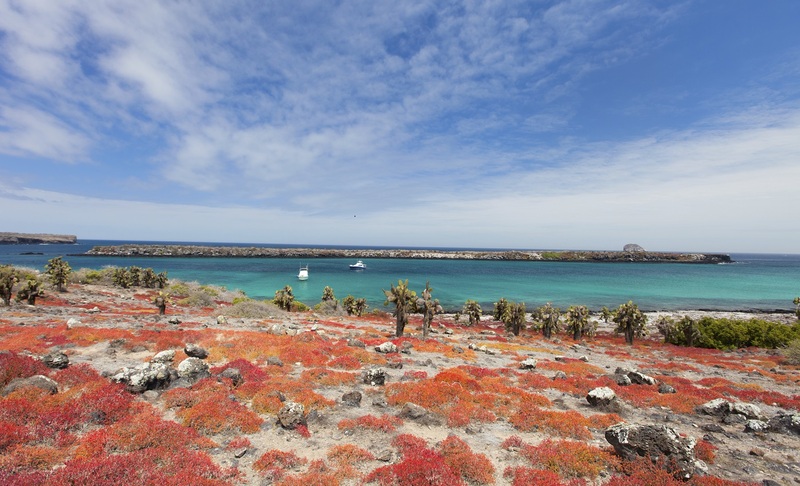 In the Van Straiten Exhibition Hall, there is great documentation about the Galapagos Islands with photos and diagrams. The vegetation on this hike is exuberant green, and a lot of Darwin's finches are easy to spot. Drive up to the highlands in a bus. In a short time one can see the transition between the different vegetation zones from the Arid zone to the Transition zone up to the Scalesia zone (and agricultural area), where the problems of introduced animals and plants are quite obvious. On the highest point of the road the National Park starts again. “El Chato”: we visit a farm in the highlands of Santa Cruz to look out for the Galapagos Tortoises in liberty. During their migration routes the spend part of the year in these highlands and can be easily observed. Wet landing on a wonderful, long, white beach made of coral sand. For this visit you don't need shoes. 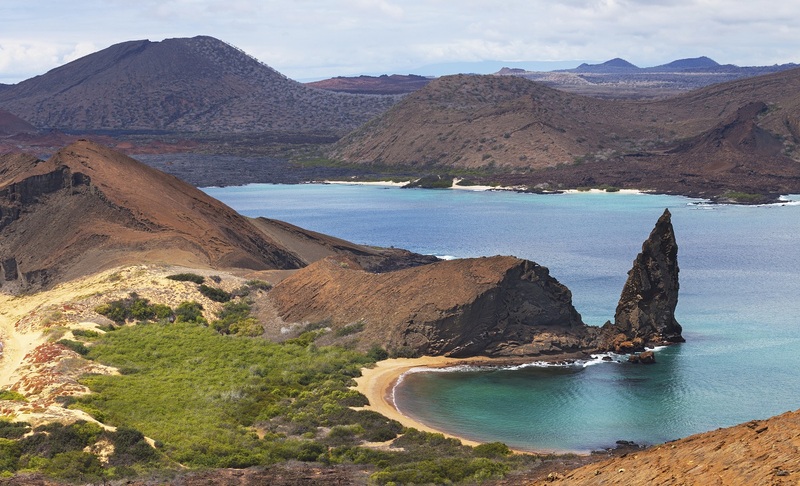 Very good place to observe the finches and mockingbirds in the saltbush vegetation, you can also enjoy the beach close to the Galapagos sea lions. You have the opportunity to swim and snorkel from the beach. Loop trail with an easy, dry landing on a jetty. The walk on a stony, rocky ground is long and quite difficult. 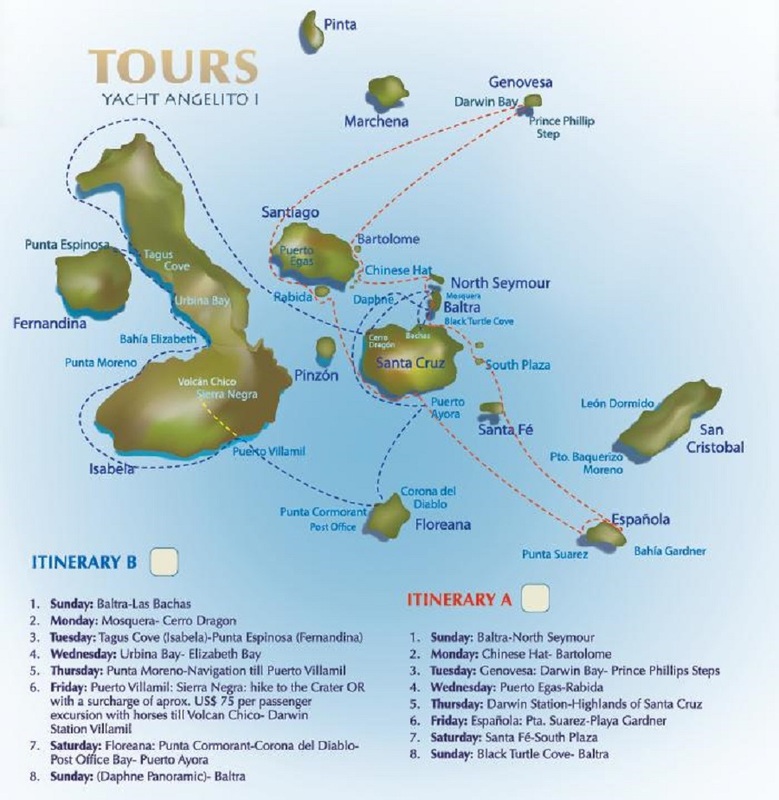 The visitors can find even on the very beginning of the trail the colourful "Española marine iguana" and Galapagos sea lions. Everywhere the curious Española mockingbird approaches the visitors. The trail leads through the nesting colonies of blue-footed boobies, Nazca boobies and waved albatross. The big Española lava lizards are to be found everywhere. 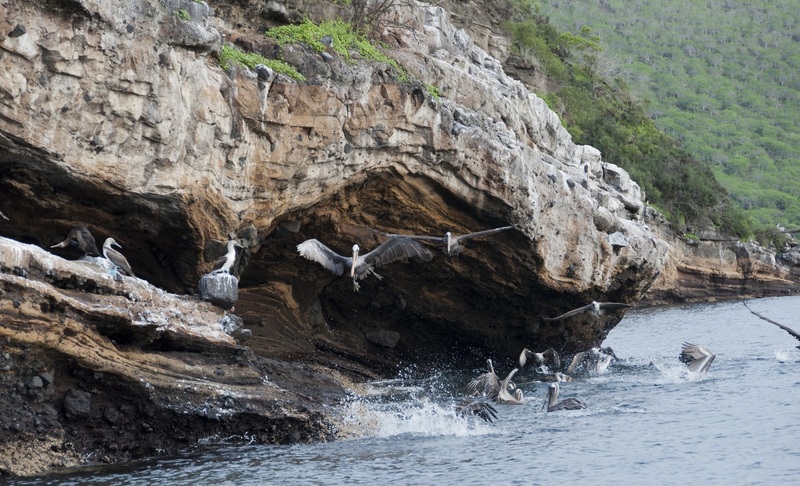 A resting spot close to a cliff gives the opportunity to watch all the different marine birds flying along the coast. An albatross during his "take off" from the cliff is an amazing event to witness. There is another stop by the blowhole where the seawater is pushed through a fissure in the cliff into the air, depending of the waves and tide level till 80 feet high. The wet landing is on a beach with a big sea lion colony. The short trail leads from the sea lion colony on the beach through dry vegetation of the Arid Zone to a wonderful forested cliff with high prickly pear cactus and then back to a second beach. Only the very attentive visitors can detect up there the endemic land iguana of Santa Fe, because he is perfectly camouflaged in the same colors of the vegetation and their territories are quiet big. Easy loop trail with a dry landing on a jetty. It’s a small uplifted island with a cliff 25 metres high on the southern side of the island. The whole flat, rocky northern coast has a big colony of Galapagos sea lions and on the East point is a bachelor sea lion colony. Very attractive are the beautiful prickly pear cactus trees and of course the big colony of land iguanas. Depending on the season, the sesuvium ground vegetation changes its colour from intense green in the rainy season to orange and purple in the dry season. 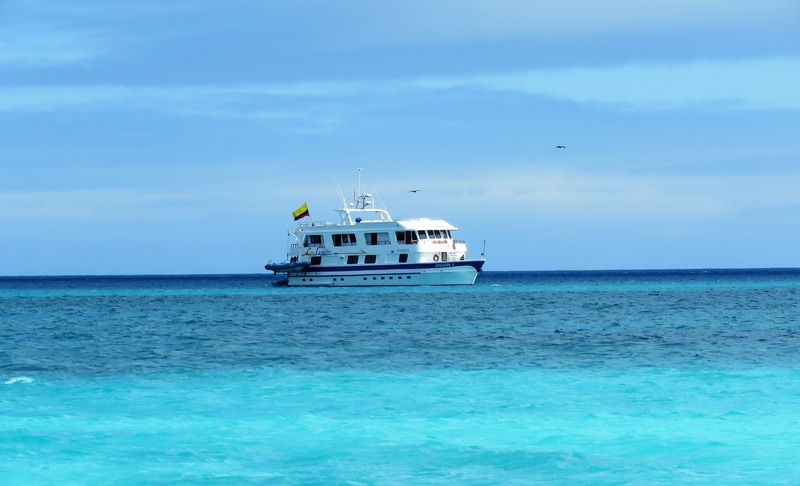 At the end of the cruise, the passengers leave the Angelito again in the harbour of Baltra and your guide takes care of everything until you fly back to the continent. 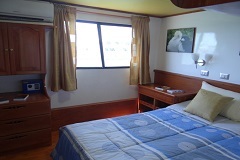 Double bed or 2 single beds, private bathroom, window, ocean view, A/C, safe, hairdryer. 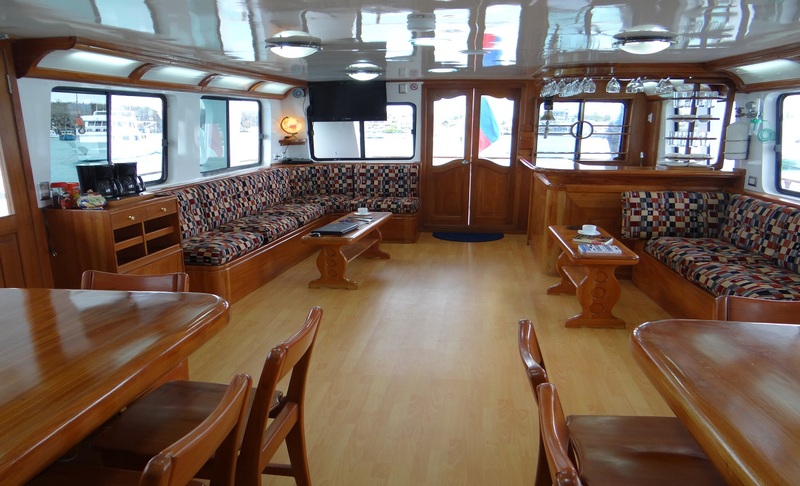 Electricity - 110 Volts in the cabins and bathroom and 220 Volt sockets available in Dining area. PureVent (= Fuel cleaner): PureVent is a radical new approach to cleaning the gas vented from engine crankcases by using centrifugal separation technology to remove oil mist and other particles, and help protect the environment. 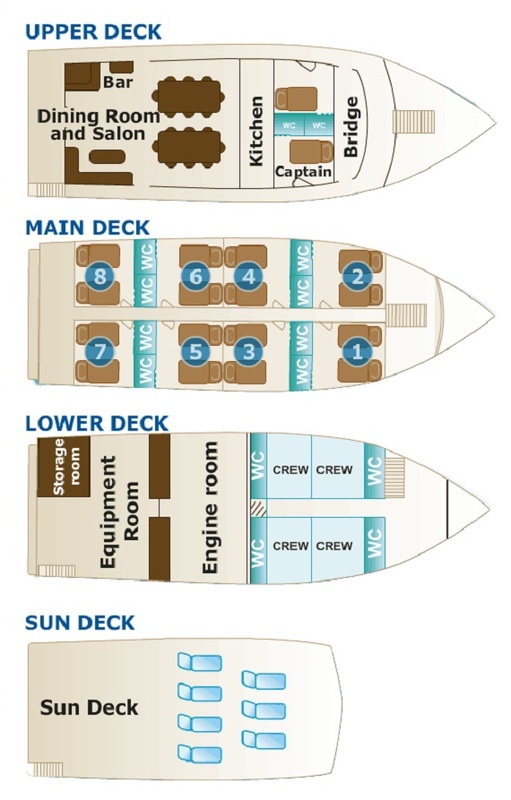 Individual Air condition in all cabins, social areas, kitchen, and bridge and engine room: Compressors with the newest technology certified for use in protected areas.